Verify the builder's name, address and phone number. Be sure to get an office number and a cell phone number, and a street address if the builder gives you a post office box. Request references on similar work performed by the contractor. Ask to see a job in progress, and ask for the name and number of a customer who had work done over a year ago. Obtain two or three bids. When comparing estimates, be sure each one is based upon the same set of plans, specifications, and scope of work. 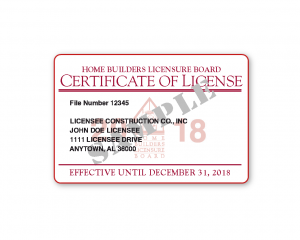 Check with professional associations and licensing boards (see listing below) to verify the builder's records. Ask to see the builder's pocket sized license card. An example is shown below. Verify that the card is watermarked with the current year. "I just finished another job in the neighborhood and am trying to get rid of this extra material." "The price I'm quoting you is very low because we plan to use your home as a demonstration model." "You will have to pay me in cash since I'm giving you such a great deal." "This offer is good today only." "Don't tell anyone else about our deal. I've charged others a lot more for the same type of work." "I'll have to have all (or half) the money up front." "I will need some additional money to order more supplies before I can finish the job." "You need to have this work done immediately. You don't have time to think about it." "The price of the materials will go up tomorrow." If a builder uses any of these lines, be very skeptical. Find other builders to bid on the job.